Improved financial outlays and a host of reforms seen in recent years can possibly transform India into a knowledge sanctuary. Worth a staggering $ 92.98 billion, the education sector is poised for major growth. According to industry estimates, by 2020, India will have the world’s largest tertiary-age population and second-largest graduate talent pipeline. Incremental solutions for the sector are met with a tepid response from educators, investors, students and parents. This necessitates edupreneurs to develop solutions that show at least a five-fold increase by fitting seamlessly into the existing system. long-lasting business models for education, while not undermining the potential of skill development that ultimately contributes to the employability of the population at large. Thus, it is important for entrepreneurs, investors and other stakeholders to channel their investments and look at building sustainable business models. 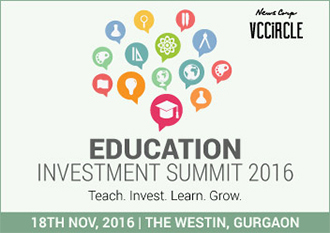 With this vision, News Corp VCCircle brings to you the 7th edition of the Education Investment Summit. The summit will see a gathering of the brightest and best minds in the field of education in the quest to provide solutions to some of the most imminent and pertinent issues in the sector. It will give the attendees an opportunity to meet potential and budding startups, entrepreneurs, investors, angels, venture capitalists, incubators, accelerators, educationalists and academicians. Few Seats are left; register now.